The county Department of Public Works laid the groundwork for three prototype slabs on Kinoole Street near Lincoln Park in downtown Hilo. Instead of using cement, the slabs are made out of volcanic basalt fines – a waste byproduct found in local quarries – and each of the three slabs is “glued” together with different binders. Rebar made out of basalt instead of traditional steel was used to reinforce one of the slabs. Basalt rebar is 25 percent lighter than steel, twice as strong and is extremely resistant to corrosion. Funded by the county Department of Research and Development, researchers will monitor the lunar sidewalk over a one-year period to see which binding agent is most effective, and analyze how well the “space slabs” hold up compared to traditional concrete. 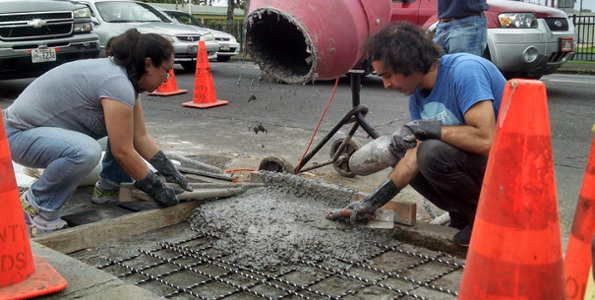 For Hawaii, lunar concrete could prove to be a sustainable, green alternative. The state currently imports 300,000 metric tons of cement from Portland per year in order to meet demand. Furthermore, cement production accounts for about 5 percent to 7 percent of global CO2 emissions. By developing homegrown cement, PISCES hopes to reduce the state’s economic and environmental costs associated with cement production. Because Hawaii’s volcanic basalt is nearly identical to the regolith (dirt) found on the moon, Mars and asteroids, the successful development of lunar concrete could prove to be a groundbreaking method used to build structures and human bases on other planets.